ROME (AP) — Spain’s maritime rescue service said Sunday it rescued more than 400 people from 15 small boats, most of them off the country’s southern coast, while humanitarian groups lamented that the sole private rescue boat operating near the deadly central Mediterranean human trafficking route risked being put out of action by Italy’s anti-migrant leaders. But SOS Mediterranee and Doctors Without Borders, the humanitarian groups jointly operating Aquarius 2, say violence-wracked Libya doesn’t meet international standards for safe harbor. On Sunday, they asked European governments to reassure Panama that Italy’s contentions are unfounded or issue a new flag so Aquarius 2 can keep operating. Right-wing Interior Minister Matteo Salvini won’t let private rescue boats dock in Italy. In a statement Sunday, the two non-governmental organizations alleged that Italy had forced the Panamanians to revoke the registration “under blatant economic and political pressure from the Italian government,” which has vowed to stop arrivals in Italian ports of migrants saved by private rescue boats. But U.N. refugee agency officials say the central route from Libya is by far the deadliest for migrants smuggled by sea. Aquarius 2 was carrying 58 migrants it rescued in the last few days, and where they would be taken was unclear Sunday night. The U.N. refugee agency says largely lawless Libya, bloodied by a recent surge in fighting among militias, isn’t a safe harbor. Migrants returned there are brought back to detention centers, where food is scarce and beatings and sexual assault are common. International maritime law stipulates that those rescued at sea are brought to the nearest safe harbor. 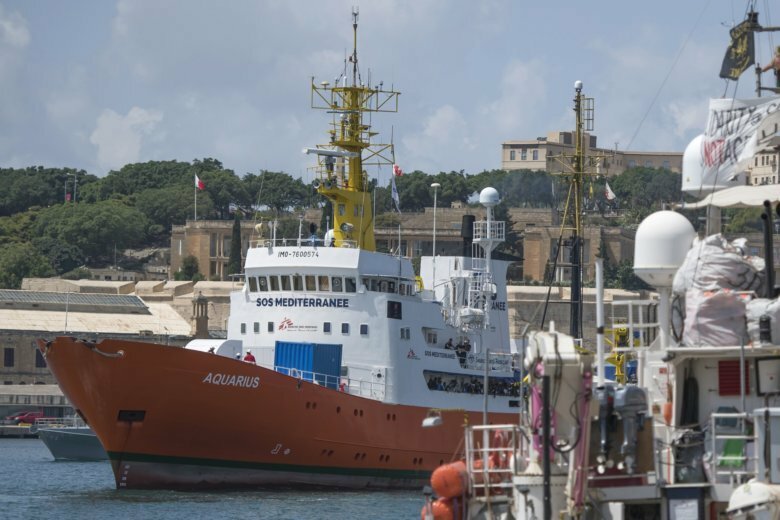 The Mediterranean island of Malta has also come down hard on private rescue boats, blocking the vessels in their harbors and launching prosecutors’ probes of their crew. In a second case, 83 migrants, 11 of them minors, and most of them Pakistanis (76), were discovered packed in a truck coming from Greece. The truck driver was detained and the migrants transferred to the reception center in the southern town of Gevgelija. Joseph Wilson in Barcelona, Spain, and Konstantin Testorides in Skopje, Macedonia, contributed to this report.